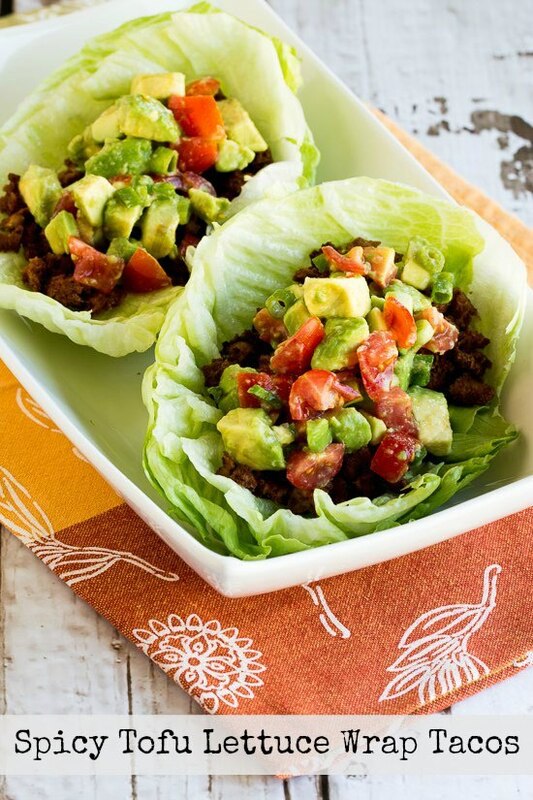 Crumbled tofu is baked with spices to become the filling in these Spicy Tofu Lettuce Wrap Tacos that are low-carb, low-glycemic, vegan, dairy-free, South Beach Diet friendly and gluten-free; we loved them with avocado-tomato salsa. Use the Diet-Type Index to find more recipes like this one. Click here to PIN Spicy Tofu Lettuce Wrap Tacos! When I went to Kenya and Istanbul with my blogging friend Donna earlier this year, one of the nights in Nairobi we cooked a Mexican food dinner for a bunch of ex-pats who were friends of Donna’s daughter Kate and her husband Neil. Apparently good Mexican food is impossible to get in Kenya, and we made a huge Mexican feast for the crowd. Donna is not only a good traveling companion and a very creative food blogger, but she’s also a prolific cookbook author, and for the vegetarians attending the dinner she made amazing tofu tacos using a recipe from the book 101 Things to do with Tofu that she wrote with her daughter Anne. 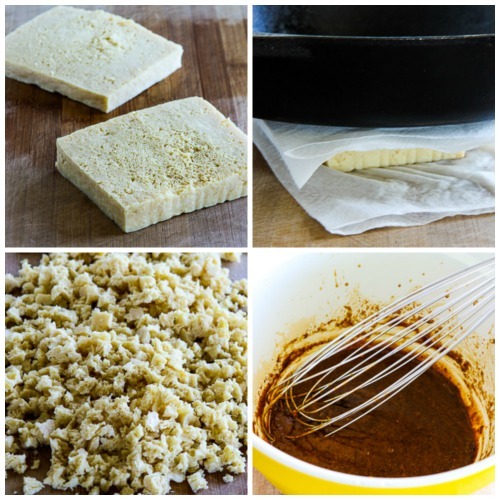 I was intrigued by the process that turned extra-firm tofu into taco filling that really did taste great, and I liked the tofu tacos so much I got permission from Donna to share the recipe with my readers. I actually made these Spicy Tofu Lettuce Wrap Tacos in early June, shortly after Donna and I returned from our trip, but the crumbled tofu has to be baked for nearly an hour, and I didn’t think a recipe like that would be a hit in the summer! So I’ve been waiting eagerly to share this recipe with you. And even though I am kind of known for never following a recipe the way it’s written, I didn’t change Donna’s ground tofu filling recipe much at all. I have a few favorite tofu recipes, but overall I’m not a very experienced tofu cook, so I can’t wait to try some of the other ones from Donna’s book.Of course these Spicy Tofu Lettuce Wrap Tacos are my Meatless Monday suggestion for this week. For more ideas for meatless dinners, use the Recipes-by-Photo Index Page for Meatless Monday or check my Pinterest boards for Meatless Monday Recipes and Best Meatless Main Dishes. You will need 14-16 ounces of extra firm tofu, which has to be frozen and thawed to use in this recipe. Then press the tofu to remove most of the water (we used a heavy cast-iron pan to press out the water.) Crumble the pressed tofu, and mix together the softened peanut butter, soy sauce, ground cumin, garlic powder, Ancho chile powder, and Cholula. 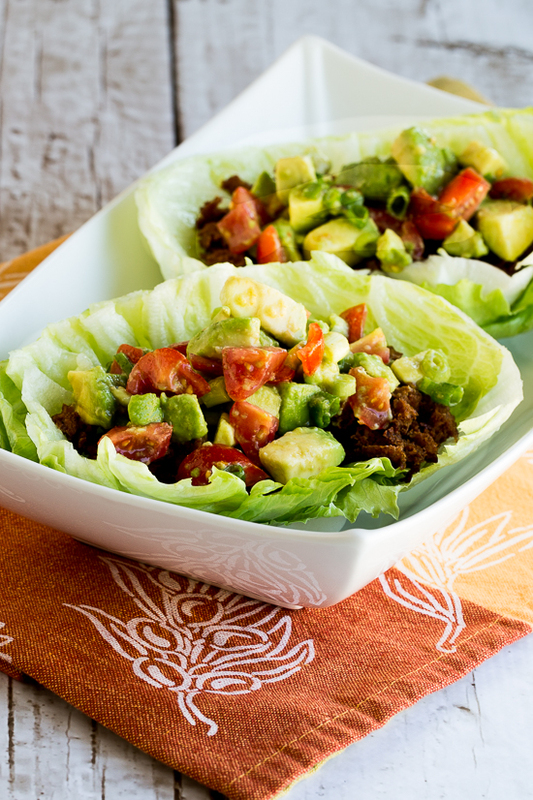 While the tofu bakes, prepare the lettuce cups and combine avocado, lime juice, diced tomato, green onions, olive oil and a pinch of ground cumin to make the avocado-tomato salsa. Fill the lettuce cup with a scoop of the tofu mixture and top with the salsa. Jake and I gobbled these up at the end of a long day of recipe testing when we weren’t even that hungry! For more tasty dinners with lettuce wraps, check out Delicious Low-Carb and Keto Wraps with Lettuce, Collards, or Cabbage. Crumbled tofu is baked with spices to become the filling in these Spicy Tofu Lettuce Wrap Tacos. Tofu must be frozen and thawed for this recipe, so plan ahead for that. Cut the thawed tofu crosswise into 2 thin pieces, arrange tofu pieces on several layers of paper towel, top with more towels, and put something heavy on the towel to press out the water. While tofu is pressing preheat oven to 350F/175C. Put the peanut butter into a medium-sized bowl and microwave for a few seconds to soften, then stir in the soy sauce, ground cumin, garlic powder, ground Ancho chile or chili powder, and Cholula or other hot sauce. When the tofu is mostly dry from being pressed, crumble into pieces with your fingers and mix with the sauce. 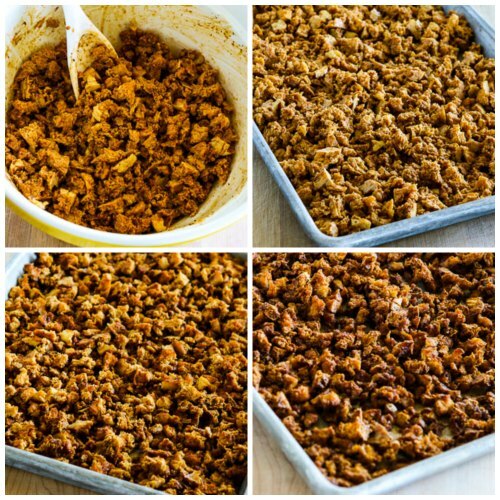 Spread out the seasoned tofu crumbles on the baking sheet and bake 20 minutes, then turn tofu over and spread out again. Bake 20 minutes more, then turn tofu again. Bake 10-20 minutes more, or until all the liquid has evaporated and the tofu is slightly browned. While tofu bakes, remove core from lettuce and cut heads in half, then peel off several layers at a time to make large cups to fill with the tofu mixture. Chop the avocado into small chunks, put in a small bowl, and toss with 1 T lime juice. Add the diced tomato, sliced green onion, other 1 T lime juice, olive oil, and ground cumin and gently stir together to make the salsa. When tofu is dried out and slightly browned, fill each lettuce cup with a scoop of the tofu mixture, top with a scoop of salsa, and serve. This ground tofu filling recipe is from 101 Things to do with Tofu, written by my friend Donna and her daughter Anne. Tofu is a good Low-Carb choice that’s recommended for all phases of the South Beach Diet and Spicy Tofu Lettuce Wrap Tacos should be suitable for most low-carb eating plans. This is seriously beyond delicious. One of my favorite recipes ever! I have tried it both frozen and thawed and just straight out of the package (and drained VERY well) and they’re both great. I prefer just out of the package honestly because it saves me time and texture is still fine for me with the baking and the sauce. Love it! SO happy you are enjoying it! All credit to my friend Donna who let me share the recipe here! how much garlic powder did you use in the sauce? It's not listed in ingredients .. I'm guessing about 1/2 tsp? Good catch, so sorry about that. Just checked my notes which say 1 tsp. garlic powder, but you could certainly use less if you're not that into garlic. I will edit the post right now. thanks… love garlic. making this tonight. thanks! So glad you enjoyed it! I was just as impressed with the recipe; that's why I asked Donna if I could share it here. Looks fantastic Kalyn! I'm a tofu fan, but my hubby could pass, but I bet he'll eat his tofu in this tasty recipe. Thanks so much; hope you will try it out on him. We made these last night for the vegetarian son and it was a hit. I thought I got the tofu a little dry, like kibble almost. I think the last 20 minute round was unnecessary and I think it was so because we used our 23lb lead brick as a weight to dry out the tofu and I think it did a really good job! The spice seasoning was stellar. And the avo salsa kept everyone happy. I prepared a can of veg refried beans for those that wanted a tostado shell instead of lettuce…the tofu was able to stick int he beans and stayed on the shell. There wasn't a morsel left over with just three people eating. We added grated cheese and shredded lettuce. Thanks Kalyn, another hit recipe! So glad to hear it was a hit! And I think you're right that if the tofu is drained particularly well you might not need to cook so long. The email that arrived with this recipe had a McDonald's ad at the top. Couldn't help but laugh seeing a photo of a Big Mac above your recipe for tofu lettuce wraps. Yes, I have no control over the ads that show up in the e-mails, but the ads do keep the e-mail service free for me! Pretty funny! As you might expect, I love this recipe–and that you put the filling in lettuce cups!! Thanks Letty! Such a brilliant idea from our friend Donna! I am so excited about these!! I crave tacos pretty much all the time and these look awesome. Thanks Joanne! Hope you like it as much as I did! 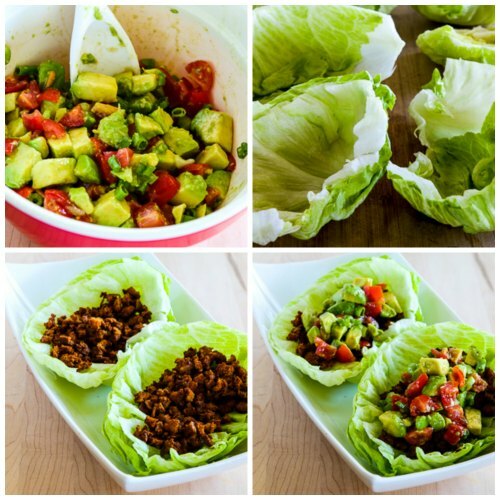 Your spin on this recipe is beautiful – love the lettuce cups. I made this last night for our weekly family dinner and was reminded of how much I love this recipe! I can't tell you what a thrill it is to have you love one of my recipes! Donna, thank you again for letting me share it, and I do love it! I have never frozen tofu before, I didn't know about the texture thing. And have never cooked it like this either, so I am really curious about this. I will give it a try. Adina, I was intrigued when Donna made this, and I was really thrilled with how tasty it was; hope you enjoy! I love the combination of flavors and method of cooking the tofu. What's the reason for freezing and thawing? Lydia, freezing changes the texture of tofu, making it "meatier." I've seen this technique in other recipes as well, although I'm not sure what would happen if you tried this without freezing the tofu.